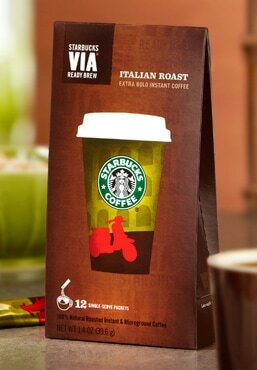 Now you can enjoy our bold and roasty-sweet Italian Roast in an instant. Just tear open a pack of Starbucks VIA® Ready Brew and add water. Let the coffee brew 10 seconds, stir, savor and enjoy. It’s not instant coffee the way you know it. This is genuine, dark-roasted Starbucks® coffee. 100% arabica and ethically sourced. Isn’t it wonderful? There’s now an instant and microground coffee that you can start a whole new tradition with. A chocolate caramel shortbread and a slideshow of Rome.